It’s Easter coming up this weekend and I’m enjoying some excellent Easter themed knitting. I realize that wee Hunter will not remember this occasion but I’m still looking forward to knitting her up a little bunny and photographing her to death surrounded by colourful eggs. I haven’t started my bunny yet, but I’m confident I can pull this off in 4 days. The pattern is a free one from Spud and Chloe’s blog (I recommend you check it out, there are quite a few nice free patterns there). It’s a cute little guy knit in Spud and Chloe Sweater in the colour Ice Cream and stuffed with a tennis ball. This is a pic from the pattern, since mine is a work in progress. When I went searching for a charming little knit for the coming event I found many cute patterns out there! Easter is a perfect time to pick up those pastels you’ve been coveting but not sure what to do with too. 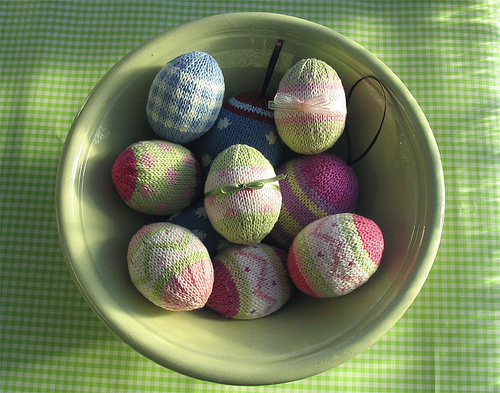 One of my faves is this little combination of pastels, fair isle, and eggs. You will need a variety of sock yarns in an eastery pallet for these little joys. They won’t go bad and you don’t have to dye these ones up! 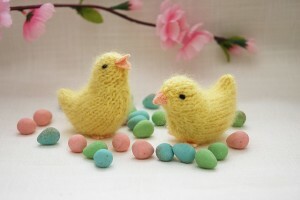 These little chickadees are also a quick knit and a good introduction to toy knitting. They don’t have too many fussy parts but they have enough shaping to pose a small challenge to the beginner knitter. I’m knitting mine up in Spud and Chloe but any aran weight (18 stitch gauge) will do. I’m going to put a cat toy with a bell in it inside the chickadees for a little added fun. Last but not least are some pretty little fuzzy chicks. I’m thinking Blue Sky Alpacas Brushed Suri of course, although I’ll be knittng mine in white and blue instead of yellow. A fuzzy Peter Rabbit would also make some adorable chicks. Just choose a needle 2 sizes smaller than the one recommended on the ball band to knit with. This will make a nice tight fabric so your fill won’t show through between your stitches. 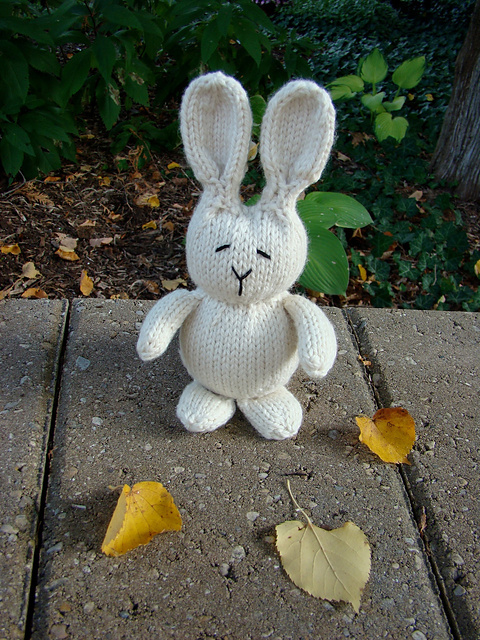 Enjoy some fun seasonal knits! This entry was posted on Monday, April 18th, 2011 at 11:39 pm	and is filed under Uncategorized. You can follow any responses to this entry through the RSS 2.0 feed. Both comments and pings are currently closed.